Action figures have come on a long way since I collected Star Wars figures in the '70s. Back then you were lucky if the head swivelled, and you could forget about knee and elbow joints. 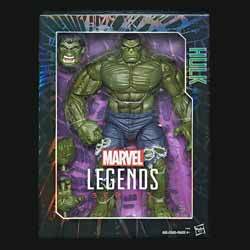 The Marvel Legends Series: Hulk 14.5-Inch Action Figure contains over 30 points of articulation (more than I can manage most days) allowing collectors and kids alike to set it up in epic poses. It comes complete with a pair of alternate hands and an alternate head. 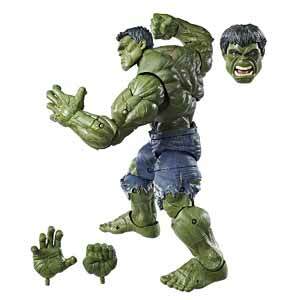 So now Hulk can look either solemn or angry. The spare hands mean that both of his fists can be clenched (or just one) or both can appear to be grabbing (or just one). This isn't really a toy. It's more a collector's item for fans that truly love all things Hulk related. I don't think there's been a Hulk "toy" that's been this detailed... oh, and the thing weighs a tonne. Before you balk at the price, this is a beautifully crafted and well presented action figure that will take pride of place in any Hulk fan's collection, just make sure you reinforce the shelf it's going to stand on.